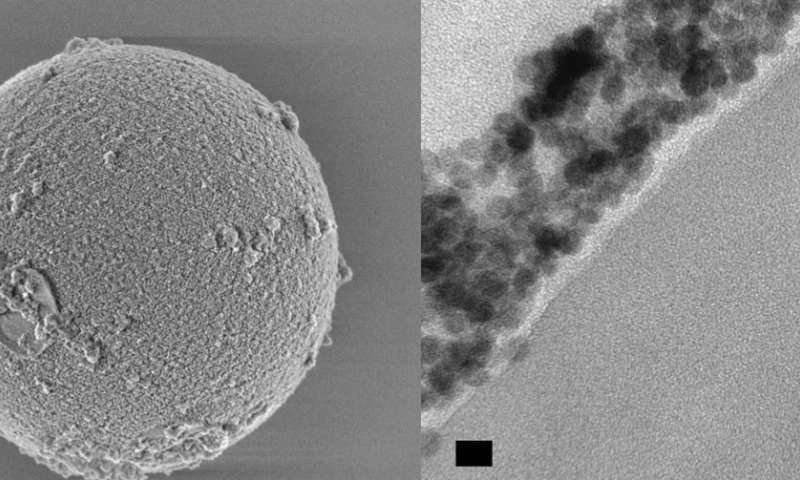 Researchers have found a way to convert nanoparticle-coated microscopic beads into lasers smaller than red blood cells. 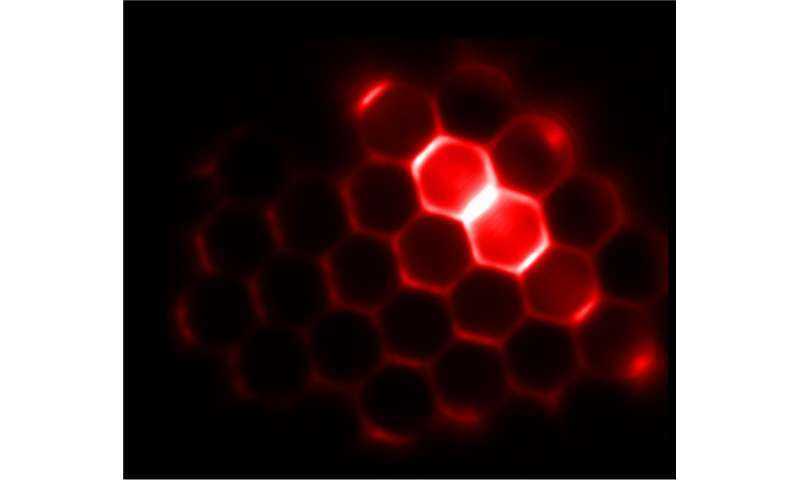 These microlasers, which convert infrared light into light at higher frequencies, are among the smallest continuously emitting lasers of their kind ever reported and can constantly and stably emit light for hours at a time, even when submerged in biological fluids such as blood serum. The innovation, discovered by an international team of scientists at the U.S. Department of Energy's Lawrence Berkeley Laboratory (Berkeley Lab), opens up the possibility for imaging or controlling biological activity with infrared light, and for the fabrication of light-based computer chips. Their findings are detailed in a report published online June 18 in Nature Nanotechnology. The unique properties of these lasers, which measure 5 microns (millionths of a meter) across, were discovered by accident as researchers were studying the potential for the polymer (plastic) beads, composed of a translucent substance known as a colloid, to be used in brain imaging. Angel Fernandez-Bravo, a postdoctoral researcher at Berkeley Lab's Molecular Foundry, who was the lead author of study, mixed the beads with sodium yttrium fluoride nanoparticles "doped," or embedded, with thulium, an element belonging to a group of metals known as lanthanides. The Molecular Foundry is a nanoscience research center open to researchers from around the world. Emory Chan, a Staff Scientist at the Molecular Foundry, had in 2016 used computational models to predict that thulium-doped nanoparticles exposed to infrared laser light at a specific frequency could emit light at a higher frequency than this infrared light in a counterintuitive process known as "upconversion." Also at that time, Elizabeth Levy, then a participant in the Lab's Summer Undergraduate Laboratory Internship (SULI) program, noticed that beads coated with these "upconverting nanoparticles" emitted unexpectedly bright light at very specific wavelengths, or colors. "These spikes were clearly periodic and clearly reproducible," said Emory Chan, who co-led the study along with Foundry Staff Scientists Jim Schuck (now at Columbia University) and Bruce Cohen. The periodic spikes that Chan and Levy had observed are a light-based analog to so-called "whispering gallery" acoustics that can cause sound waves to bounce along the walls of a circular room so that even a whisper can be heard on the opposite side of the room. This whispering-gallery effect was observed in the dome of St. Paul's Cathedral in London in the late 1800s, for example. In the latest study, Fernandez-Bravo and Schuck found that when an infrared laser excites the thulium-doped nanoparticles along the outer surface of the beads, the light emitted by the nanoparticles can bounce around the inner surface of the bead just like whispers bouncing along the walls of the cathedral. Light can make thousands of trips around the circumference of the microsphere in a fraction of a second, causing some frequencies of light to interact (or "interfere") with themselves to produce brighter light while other frequencies cancel themselves out. This process explains the unusual spikes that Chan and Levy observed. When the intensity of light traveling around these beads reaches a certain threshold, the light can stimulate the emission of more light with the exact same color, and that light, in turn, can stimulate even more light. This amplification of light, the basis for all lasers, produces intense light at a very narrow range of wavelengths in the beads. Schuck had considered lanthanide-doped nanoparticles as potential candidates for microlasers, and he became convinced of this when Chan shared with him the periodic whispering-gallery data. 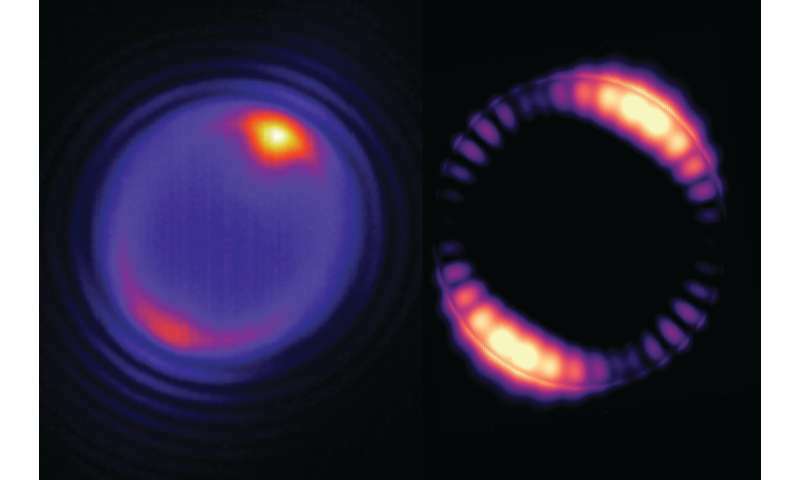 Fernandez-Bravo found that when he exposed the beads to an infrared laser with enough power the beads turned into upconverting lasers, with higher frequencies than the original laser. He also found that beads could produce laser light at the lowest powers ever recorded for upconverting nanoparticle-based lasers. "The low thresholds allow these lasers to operate continuously for hours at much lower powers than previous lasers," said Fernandez-Bravo. Other upconverting nanoparticle lasers operate only intermittently; they are only exposed to short, powerful pulses of light because longer exposure would damage them. "Most nanoparticle-based lasers heat up very quickly and die within minutes," Schuck said. "Our lasers are always on, which allows us to adjust their signals for different applications." In this case, researchers found that their microlasers performed stably after five hours of continuous use. "We can take the beads off the shelf months or years later, and they still lase," Fernandez-Bravo said. Researchers are also exploring how to carefully tune the output light from the continuously emitting microlasers by simply changing the size and composition of the beads. And they have used a robotic system at the Molecular Foundry known as WANDA (Workstation for Automated Nanomaterial Discovery and Analysis) to combine different dopant elements and tune the nanoparticles' performance. The researchers also noted that there are many potential applications for the microlasers, such as in controlling the activity of neurons or optical microchips, sensing chemicals, and detecting environmental and temperature changes. "At first these microlasers only worked in air, which was frustrating because we wanted to introduce them into living systems," Cohen said. "But we found a simple trick of dipping them in blood serum, which coats the beads with proteins that allow them to lase in water. We've now seen that these beads can be trapped along with cells in laser beams and steered with the same lasers we use to excite them." The latest study, and the new paths of study it has opened up, shows how fortuitous an unexpected result can be, he said. "We just happened to have the right nanoparticles and coating process to produce these lasers," Schuck said.